As one of our investigative sites, Land Arts traveled to the Navajo or Diné Nation to survey the extractive industries in the region. For many decades, the lands of the Navajo have been disrupted and polluted through mining for coal, uranium, oil and gas. These processes have unsettled traditional ways of life and have caused great harm to the land and to the people. 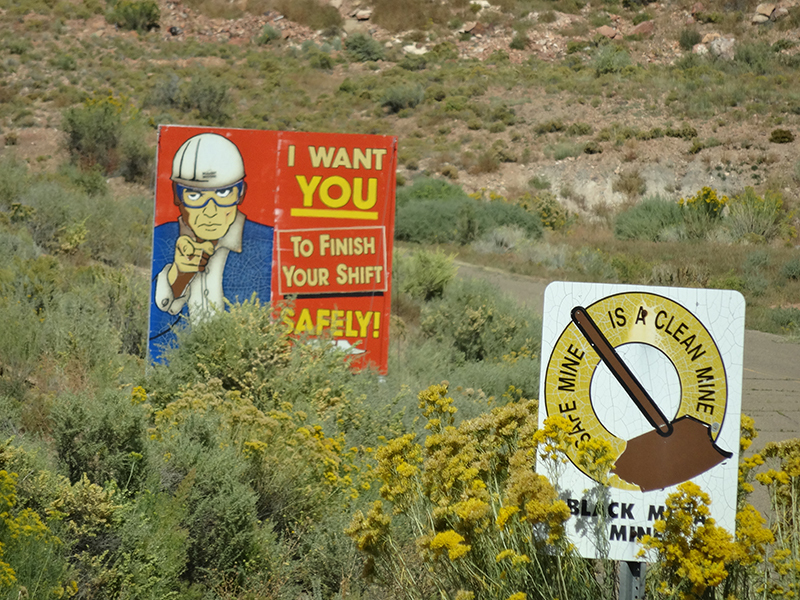 During our visit, three days were dedicated to traveling and investigating uranium, coal, and natural gas extraction. 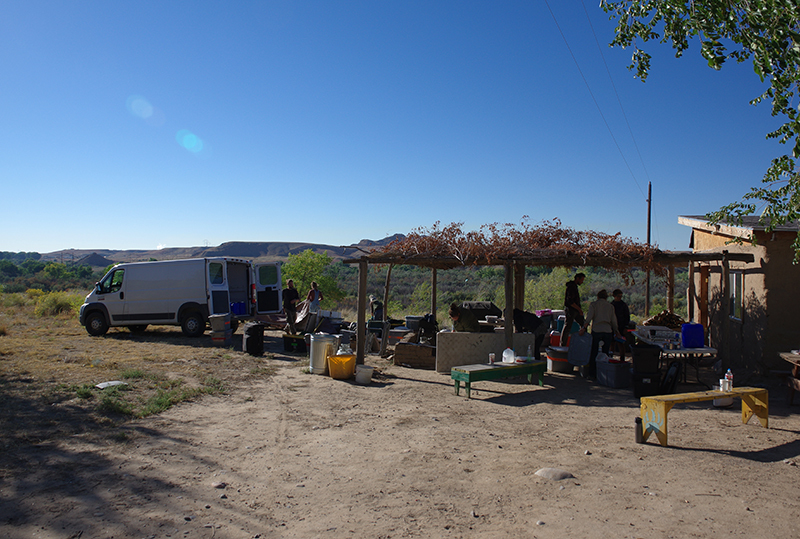 Native elder, farmer and artist, Larry Emerson generously hosted the Land Arts crew on his farm near Shiprock, NM. 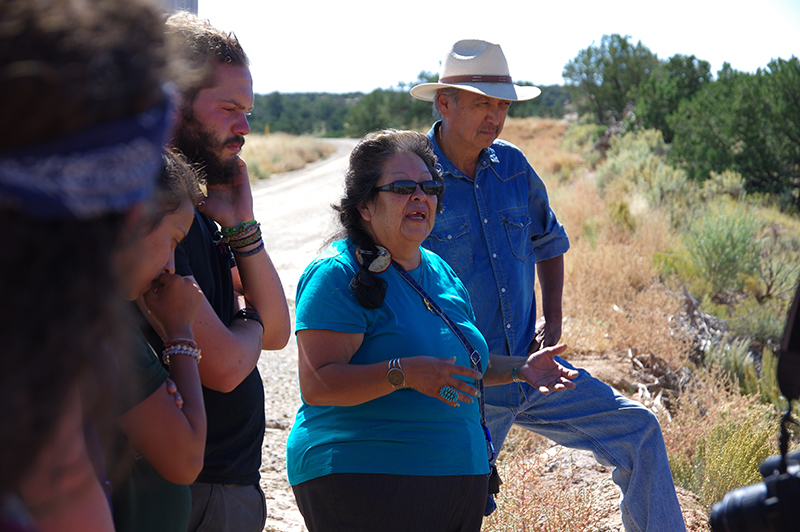 Larry also shared Diné teachings and practices with students during our visit to his home. 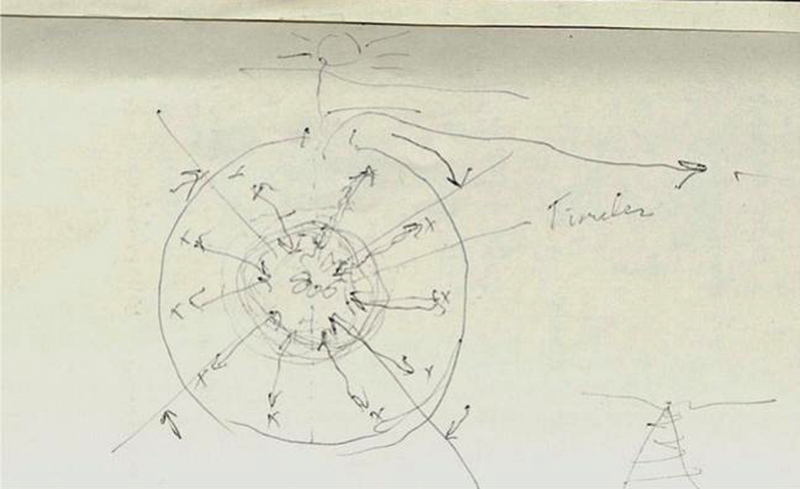 Diagram of a Hogan by Joanna Keane Lopez. 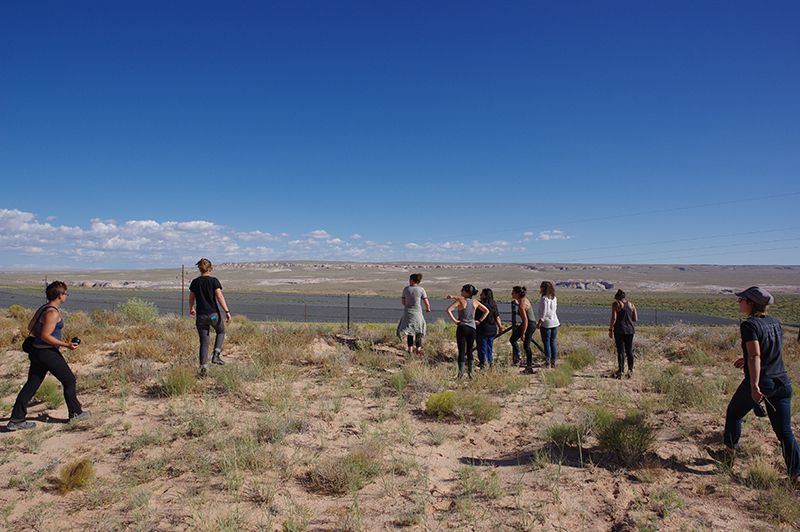 Land Arts visited “Site 160”, the grounds of a former uranium mill once operated by Rare Metals Uranium Corporation just a few miles from Tuba City. .
Land Arts students Andrea Gohl and Harriet Fawcett listen to Activist and organizer, Anna Rondon. 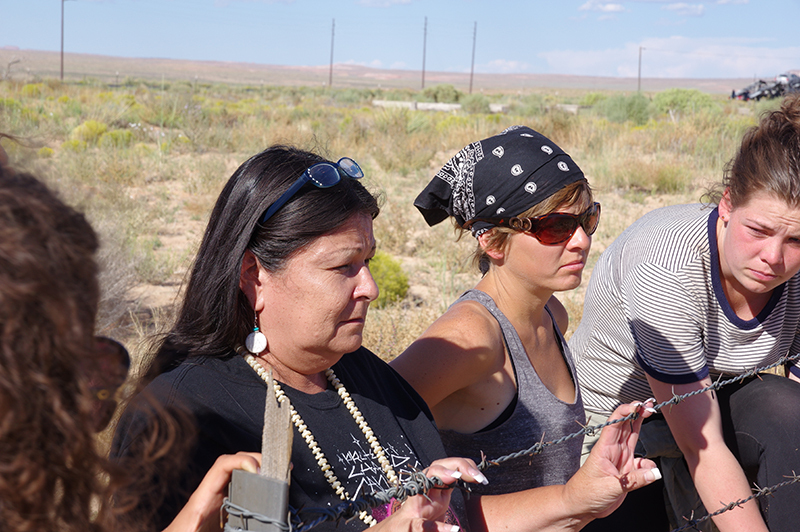 Anna led our group to numerous sites impacted by mining throughout the Navajo nation. 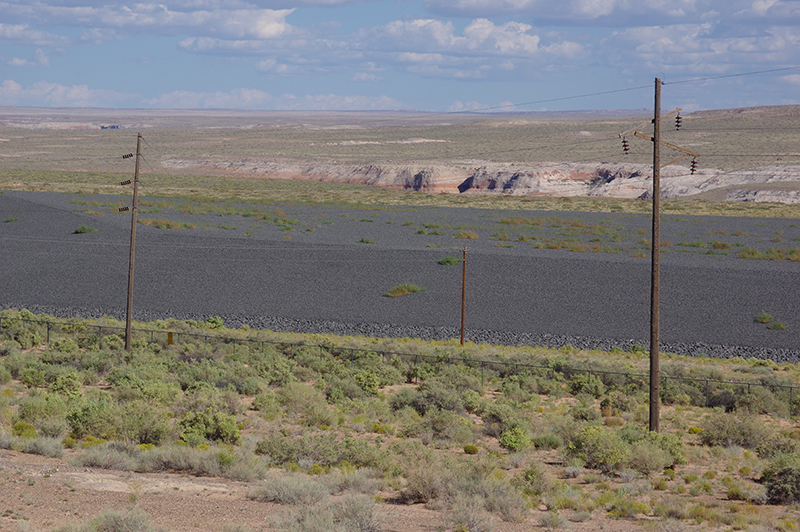 Mining for uranium ceased in 2002, but many remnants of the mining remain, such as this mound of gravel used to cap previously exposed uranium tailings. These mounds were constructed as part of remediation of the uranium processing that is sporadically taking place throughout the region. 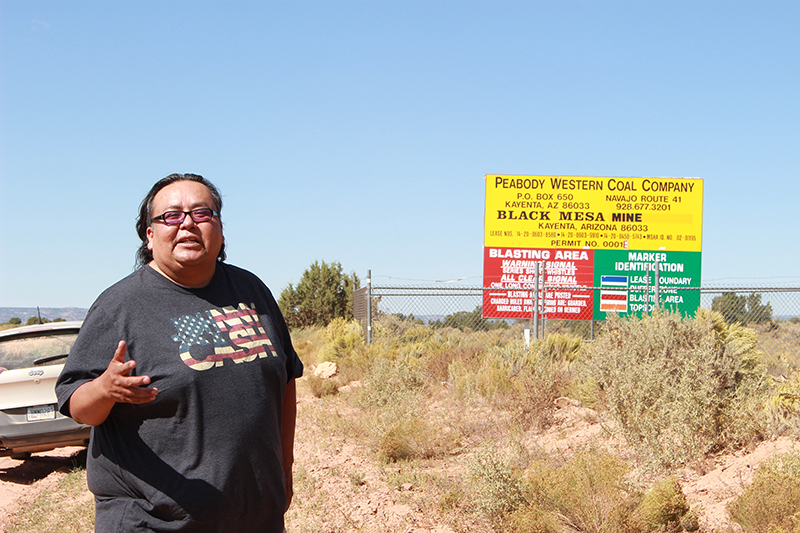 Activist, writer and filmmaker Malcolm Benally led our group the Peabody Coal mining operation at Black Mesa operated by Peabody Energy. Black Mesa is a sacred site. Its destruction has had a lasting effect both environmentally and spiritually on the Diné people. 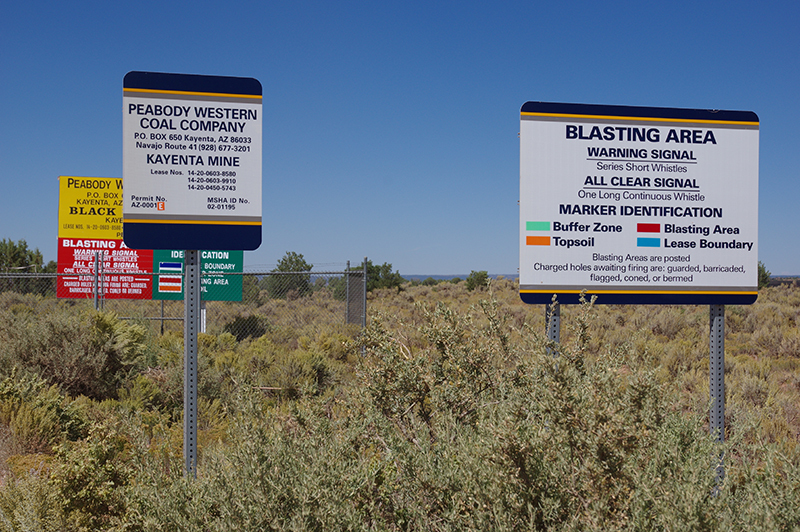 Warning signs indicating blast sites. Students overlook a conveyor that delivers coal from the mine to the railroad. 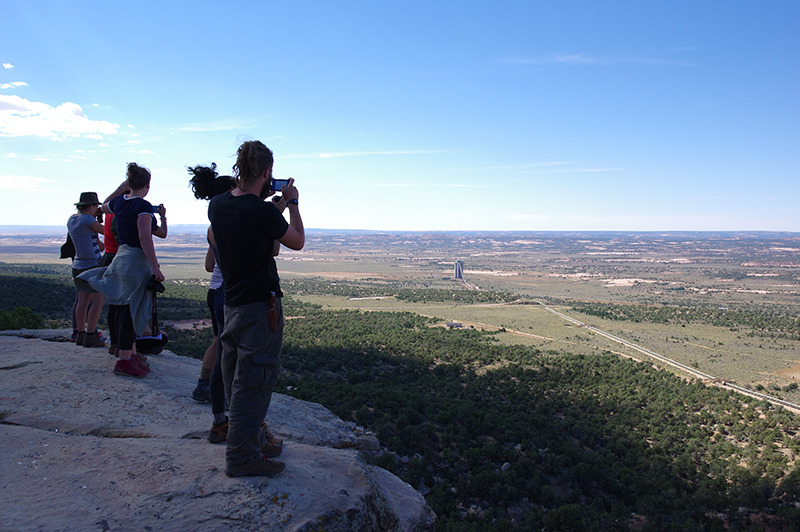 On our final day of traveling in the four corners region, Land Arts visited numerous fracking sites. Hyrdraulic fracturing or “fracking” for natural gas in the region has boomed in the last decade. 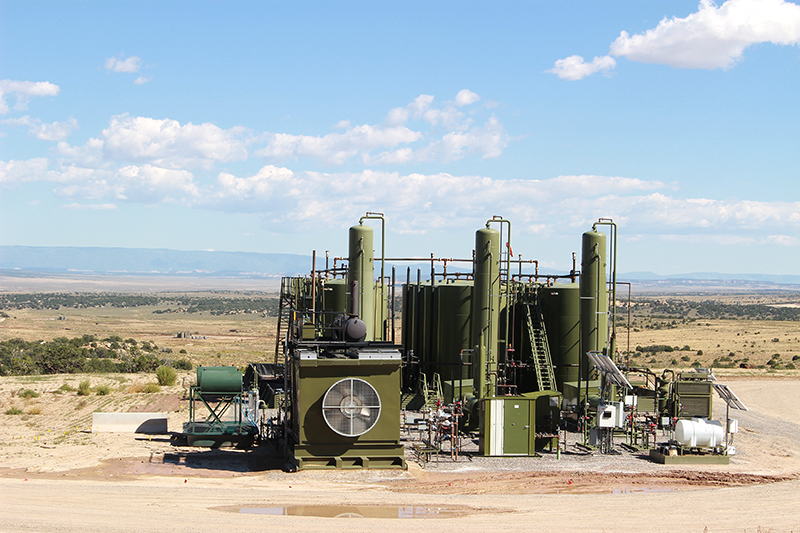 Fracking facilities have become a common feature of the landscape in the Northwestern part of New Mexico. LAAW student Sarah Molina performs in front of a hydraulic fracturing platform. Activist Etta Arviso and Larry Emerson discuss the consequences of fracking on the community. 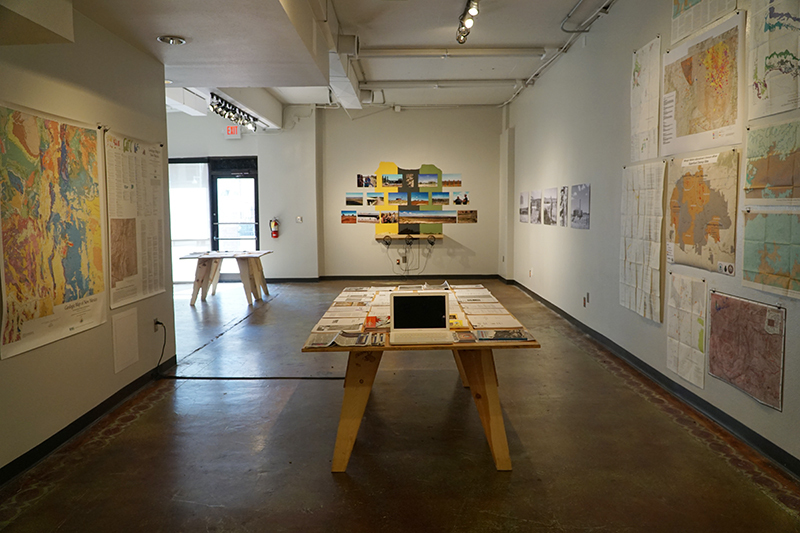 This site investigation of the Four corners region culminated in an exhibition, Stories Out/In Place located at the College of Fine Arts Downtown Studio in Albuquerque. 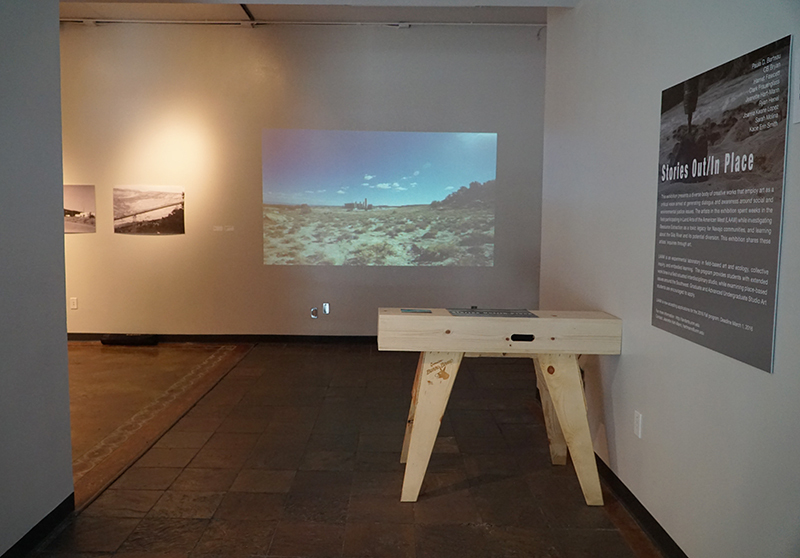 Many of participants of Land Arts of the American West as well as Larry Emerson and Malcolm Benally worked together to compile information, art and documentation about this exploration and share it with the larger public. Maps of mining sites, superfunds sites and geological land features where exhibited along with audio recordings from the site visits.